You have an Add-Ins you love? You do not have to upgrade your Microsoft Word program before you can make use of it, though doing an upgrade is a sure way of seeing that you are able to use a wide variety of available Add-Ins since the probability of the Add-Ins being compatible with MS Words 2010 and later is higher then in MS Word 2007. But if you have an add-ins that you know or that the developer says is compatible with the Microsoft Word 2007 program in your computer, then the following guide below will show you how to load it into the Word program so that you can use it. First you will need to open the Word Options dialog box. To do this, click on the Microsoft Office Button , and then click on the Word Options button which is at the bottom left of the Office Button menu. Next, click Add-Ins in the left section. Then in the right section of the Word Option dialog box, scroll down and click on the Manage option list, and select Word Add-ins, then click Go. In the next dialog box, select the Templates tab. Then under Global templates and add-ins, select the check box next to the template or add-in that you want to load. If the template or add-in you want does not appear in the box, then click the Add button, navigate to the folder that contains the template or add-in you want, click it, and then click OK. 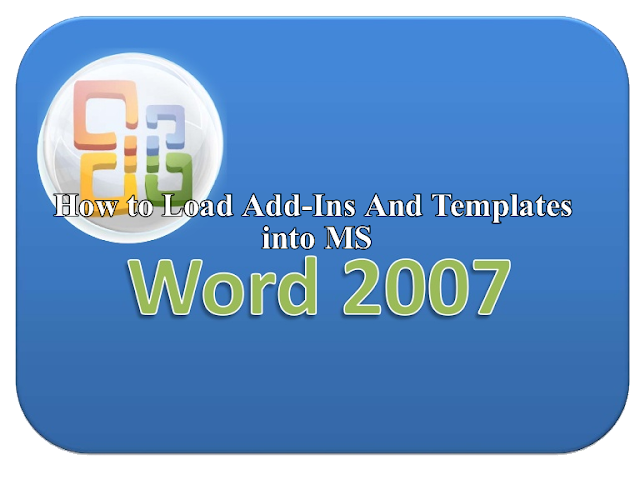 But be reminded that when you load a template or add-in, it remains loaded for the use of the only current Word session, thus If you quit and then restart your Word 2007 program, the template or add-in is not automatically reloaded, so if you need it, you will have to reload it again using the steps outline above.